Down in the sewer lair, Raphael, Michelangelo and Donatello are discussing Leonardo. Mikey is worried about Leo, as he hasn’t spoken since he went to the roof and discarded his swords. Raph blames Leo for giving up, claiming that he has always been obsessed with control and now that he’s lost it, he’s lost his will to fight. They talk about the rogue Foot Soldier, but Raphael hasn’t been able to find a trace of him anywhere in the city. They briefly consider going to Karai for help, but fear that revealing Leo’s illness will give her an opening to attack them. Don says that all he can do for now is continue running tests to try and find an antidote. What the other three Turtles don’t know is that without his sight, Leo’s other senses have heightened and, despite being in the next room, he can hear every word they say. Splinter enters Leo’s room and tells him that Casey will be driving the two of them to Northampton in the morning. The next day, Leo and Splinter arrive at the farmhouse. As Casey goes inside to unpack, Splinter takes Leo for a walk in the woods. They hike for some miles, with Leo tripping and shuffling unconfidently all the while. Eventually, they reach a short cliff overlooking a stream. Splinter hands Leo his walking stick, then punches his son off the cliff and into the water. Leo recovers, having suspected this to be “some kind of trick”. Leo figures Splinter wants him to find his way out of the woods on his own. Leo begins feeling his way through the brush, but constantly trips and falls over. Frustrated, Leo takes a seat and considers that he won’t be able to find his way home until he has a reason to want to go home. At the moment, he can’t think of a single one and feels the darkness closing in on him. Suddenly, Leo hears a figure speak to him. It is a creature who identifies itself only as nature. Leo prepares to fight it, but the creature tells the Turtle that he is trespassing in his domain and should show respect. Leo drops his walking stick and bows. The creature laughs, asking Leo if it is not better to simply submit to the whims of nature? He points out that those that dwell in nature do not know fear or weakness, but simply accept that they have no control over their fate. It is only those who dwell in Man’s world who fight nature and try to take control into their own hands. Leo asks what the creature wants and the creature says that he wants to reclaim Leo for the world of nature, as the world of Man stole him away. Leo refuses to submit and attacks with his walking stick. 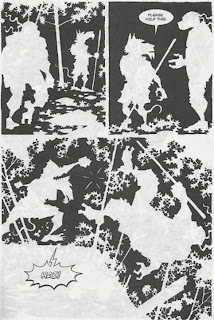 The creature breaks the stick in half and Leo uses the pieces like a pair of tonfa. The creature mocks Leo, claiming to have already won. In a haze, Leo finds himself on the rooftop wielding his swords instead of the sticks. The creature transforms into the rogue Foot Soldier and they reenact their battle. The Foot Soldier tells Leo that though his toxin took away his eyesight, it was Leo who poisoned his own mind. THAT toxin was inside Leo all along. Leo slices the Foot Soldier in half and everything vanishes in another haze. Leo awakens to find himself lying on the ground underneath a log, clutching his broken walking stick. He frees himself and feels around. At first he suspects the entire thing to have been a dream, but then finds a tree stump perfectly sliced, as if by a sword. Splinter calls to him, having been sitting on a nearby rock for some time. Splinter says he found Leo trapped underneath the log and was unable to wake or free him, so he waited. Splinter sees signs of “a great battle” in the area and asks what Leo would wish to do next. Leo says that he wants to go home. 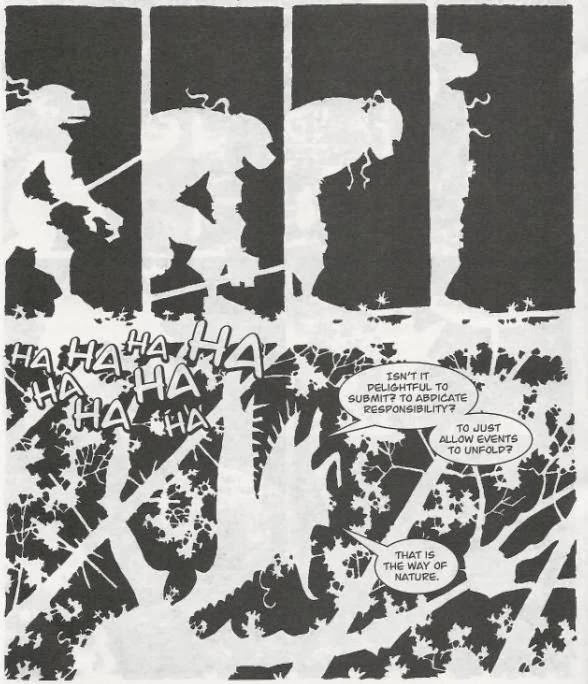 *This story is continued from Tales of Leonardo: Blind Sight #1. The story continues in Tales of Leonardo: Blind Sight #3. 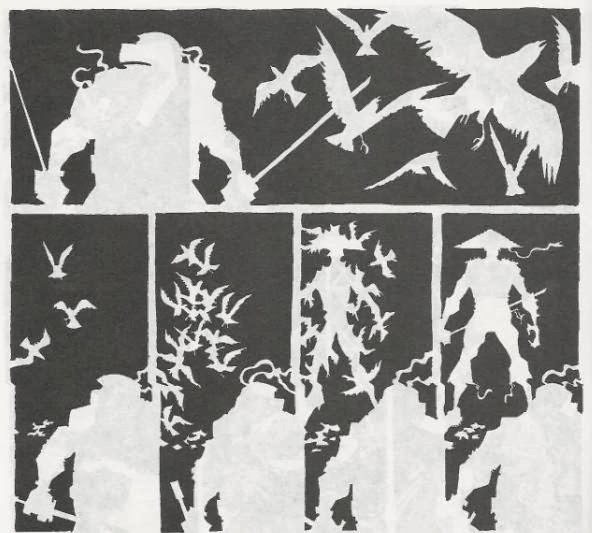 *Chronologically, the Turtles last encountered Karai in Tales of the TMNT (Vol. 2) #43. It was a tense encounter, which may explain their reluctance to trust her despite the truce established in TMNT (Vol. 1) #61. As unnecessary as I felt this follow-up miniseries to be, I will say that I like how this issue’s lesson juxtaposes with last issue’s. In the previous installment, Leo had his own vision and tried to consider what life for his family would be like if he wasn’t there to lead them. In his ego, he concluded that they would all die pathetically because they could not possibly survive without his guidance. It didn’t seem like Leo really learned much of a lesson, did it? Well, that’s where this installment comes in. It opens with Raph making the blunt but honest statement that Leo is obsessed with control, and in losing that control, he’s lost his identity and his courage. Splinter’s approach to Leo’s bruised ego and pouting is to make him man up and freakin’ deal with it. What the creature of nature teaches Leo is that he’s never been as in control as he thought he was; that there were always stronger forces at work taking choices out of his hands. Leo can either fully submit to fate and give up like a dumb animal or he can take back what control he can and keep on fighting like a man. It’s some pretty on the nose stuff, yeah, but after the ego trip from last issue, I’m satisfied with seeing Leo receive a much belated humbling. Likewise, the rogue Foot Soldier in Leo’s vision spells the mini’s plot twist out a little too obviously; I think we all probably could have pieced that revelation together on our own if given the opportunity. The bluntness of this chapter’s metaphor isn’t what bothers me so much. It’s more that Leo going into the woods of Northampton for a mystical vision quest is conquered territory. Really, REALLY conquered territory. 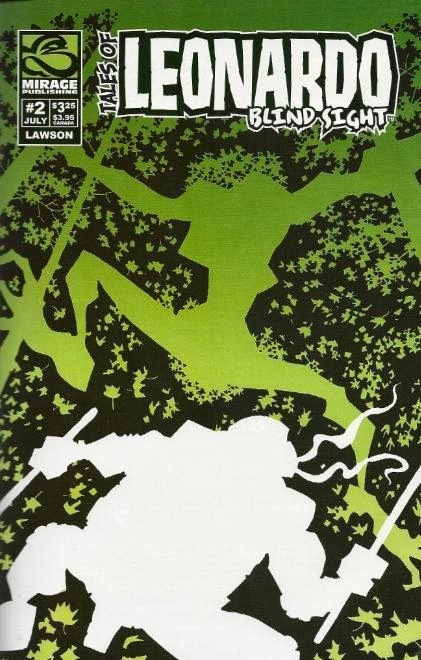 Between TMNT (Vol. 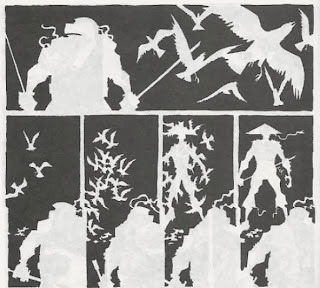 1) #26, TMNT (Vol. 1) #37 and TMNT (Vol. 1) #43, it’s like every time those guys set foot in the woods, they’re whisked away on some bizarre, metaphysical journey of self discovery. When you look at the big picture, it seems evident that within the Mirage universe, the woods surrounding the farmhouse are an “enchanted” place and so these supernatural adventures are bound to happen with some frequency. But after about the fourth or fifth time it all starts to seem rather convenient.